Former Shin Bet head Avi Dichter says Nationality Law will not be changed, slams Druze protest for calling Netanyahu a 'traitor'. Former Shin Bet head MK Dichter slammed the Druze who had verbally accosted him over his support of the Nationality Law and vowed that the legislation will not be changed despite claims that the bill is discriminatory. Dichter had been attacked by Druze on Thursday who were angry over the recent passage of the Nationality Law during ceremony granting Druze students university scholarships in Karmiel. Demonstrators had called Dichter a "Nazi" and a "traitor". As a result of the altercation, Dichter was assigned a security detail by the Knesset's security officer. As the driving force behind the Nationality Law, Dichter has borne the brunt of the anger from the Druze community. In an interview Sunday night with Hadashot, Dichter brushed away concerns for his safety and said that he was confident the police would track down those responsible for the threats. The former spymaster also blasted the Druze community for calling Prime Minister a "traitor" during a massive rally in Tel Aviv on Saturday evening. According to Dichter, "Screaming 'Bibi is a traitor' and 'Dichter is a traitor' is an extremely dangerous statement, " he claimed. "In Rabin Square, to shout to the prime minister a traitor on ideological grounds and on the issue of a law passed by the Knesset with a majority of 62 MKs is a move that we should look at a little differently." 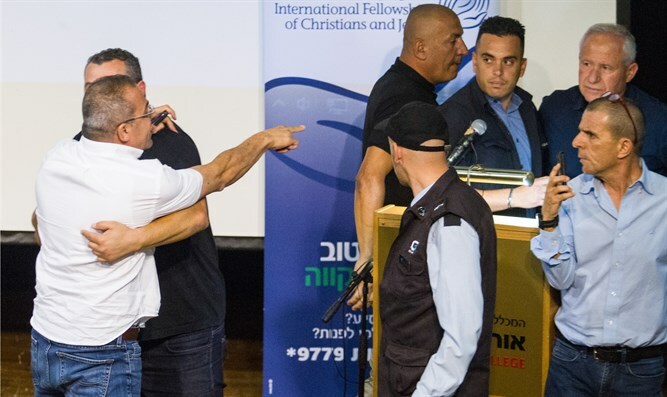 "Over the weekend I carried out hundreds of conversations and announcements, from Druze spiritual leader Sheikh Tarif to other leaders who called to apologize and said that they do not represent the Druze community," added Dichter. "I calmed them down and said that I did not attribute this to the community, I do not want to deal with it, the police will deal with it. " The Nationality Law, which was approved two weeks ago, codifies Israel’s status as the nation-state of the Jewish people into Israel’s Basic Laws. It establishes Hebrew as its sole official language while giving Arabic special standing. The bill has sparked protests by Israel's Left and the Druze minority, who contend that the legislation is discriminatory.